If your cat has sprayed your electric blanket, you will need to clean it throughly to get the odor out. 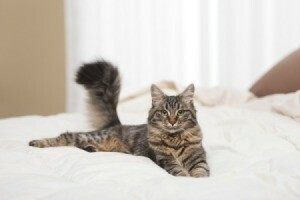 This is a guide about removing cat spray from an electric blanket. My cat just started spraying and of course he sprayed my uncle's expensive electric blanket and I can't wash it. What do I do? Perhaps you could call a local dry cleaners and tell them your problem. They may have a suggestion or they may even spot clean it. I have cleaned a spot on one but I had an area outside that I could drape the blanket over and the spot was over an open space so that I sprayed some Dove and then used a hose to run water across the small area of the spot and water just poured through the blanket. I did not scrub or twist and just ran water until it appeared clean and let it dry completely. I am not saying you should try this as it could be tricky. Dry cleaners may be the only way. Why can't you wash it?? Most are washable. You can wet the area of the spraying and treat it with a bacterial remedial product like Rid-X or Natures Miracle. You can find the part that was sprayed by shining a black light on the blanket in a dark room. The organic matter will light up. These products contain the bacteria that eat the organic matter, just like breaking down leaves in the forest. They remain in an inactive spore form until they come into contact with wet organic matter. I would recommend generously soaking the affected areas with the product, and covering the areas on top and beneath with plastic bags for a few days to allow the area to stay wet and the bacteria to work. Once the bacteria have eaten all of the organic matter, the cat spray, let the area dry and the smell should be gone. You can soak trough the blanket. The electrical wiring will not be damaged. You can probably wash the blanket but that will not completely remove the organic matter. It can only be removed by the chemical reaction of the bacteria which turns it into carbon dioxide and water. Buy Nok-Out. You can spray the blanket. You can use this on furniture, too. Make sure you saturate the spots where the cat has soiled. The odor will disappear forever.